Army Scientists at the Edgewood Chemical Biological Center and academia collaborators have been conducting research of "organs" on microchips. ECBC will test the human-on-a-chip against chemical warfare agent to learn more about how the body will respond to agent exposure and explore various treatment options for exposures. ECBC scientists were already undergoing research on four organs -- the heart, liver, lung and the nervous system -- when DTRA solicited a call for proposals. Then once the proposal was awarded, the center began working specifically on the heart, liver, lung and the circulatory system. Dr. Harry Salem, ECBC's chief scientist for Life Sciences, leads ECBC's in vitro research team working with stem cells. "Stem cells are a relatively new field of research," Salem said. "The stem cells that ECBC uses … are made from adult skin cells called induced pluripotent stem cells." 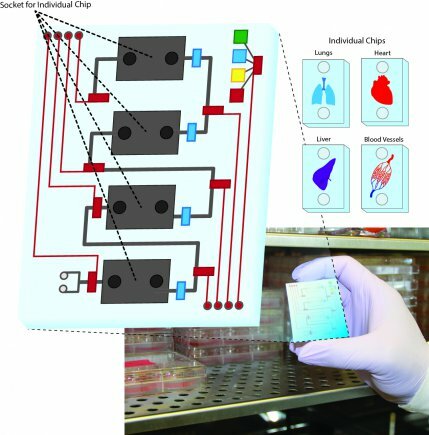 Each organ-on-a-chip is about the size of a thumb drive and is an organoid, or a small swatch of human tissue, designed to mimic the properties of an actual human organ. They are made up of multiple layers of cells growing on a membrane and are connected to each other by microfluidics, tiny micro channels that copy the function of blood vessels. Their primary purpose is to take the place of animal research. It is anticipated that new predictive models of toxicity will result from the more accurate human-on-a-chip testing. This will save both time and money. Pharmaceuticals tested on animals fail to work on humans 90 percent of the time. This technology will result in fewer test failures. Scientists will be able to narrow their research efforts by identifying which therapeutics will be effective or fail early on in the testing process. "The human-on-a-chip promises to accelerate the pace of research and consequently scientific breakthroughs," Dr. Russell Dorsey, a research microbiologist and one of the members performing the in vitro testing at ECBC, said. "For the military, our human-on-a-chip research will save actual warfighters' lives."